As seniors age, they face a unique set of challenges during their day-to-day life. What used to be simple will become more difficult, which can be incredibly frustrating for elderly people who have spent a majority of their life functioning independently. Things like bathing, cleaning, and going up and down the stairs will eventually require the help of a loved one, a caregiver, or a nurse, and there is no one-size-fits-all approach for these seniors who need a little extra assistance. At OC In Home Care, we offer non-medical home care services for seniors who prefer to age in place, rather than being relocated to an assisted living facility or nursing home. We believe that the elderly deserve personalized care that addresses their unique needs, and that this is essential for them to live happily and comfortably during their senior years. Contact our Orange County home care agency today if you’d like to schedule a consultation with our in-home caregivers, or continue reading to learn why seniors need customized elderly care. It’s no secret that people age differently. Factors like lifestyle, genetics, and overall health play a role in the complications people face as they age, including mobility issues, dementia, and incontinence, to name a few. That being said, seniors need personalized elderly care to help them overcome the unique obstacles of their daily life, which an in-home caregiver can provide. 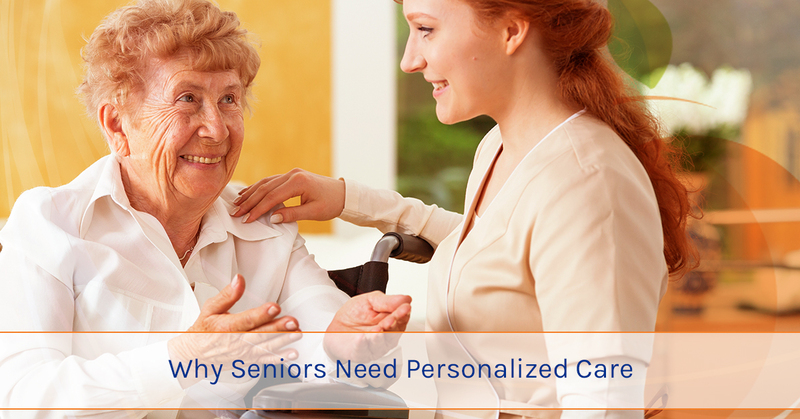 Unlike nursing homes and other senior care facilities, caregivers give your loved one their full attention and develop a customized care plan to help them get through each day. Not only do seniors have unique needs, but they also need quality elderly home care, not just anyone to come by and check on them to see if they’re doing okay. In-home caregivers have the training and experience needed to provide exceptional senior care for each of their clients, no matter what their needs are. They’ll develop a plan of action according to the senior’s unique needs and make it a goal to overcome these challenges every day. This could mean engaging the client in activities to stimulate the memory, engage basic motor functions, or simply bring a smile to their face. Another critical piece of personalized care is consistency. For many seniors, it takes a lot to fully trust someone to help them through their activities of daily life (ADLs). It can be embarrassing or uncomfortable to ask for help at first, especially when it comes to personal hygiene, but this gets easier with time as trust and comfortability develop between the senior and caregiver. At OC In Home Care, we believe that the key to quality senior care is trust, which is why each of our clients is assigned the caregiver we believe best fits their personality, lifestyle, and needs. Sometimes, all it takes is planting a seed in the right environment for it to grow into a beautiful flower. Now that you know a few of the main reasons why seniors need personalized care during their elderly years, it’s time to decide whether or not in-home care is right for your loved one. Contact OC In Home Care today to schedule a free consultation, where we’ll meet you and your loved one, talk about their unique needs, and introduce them to the caregiver we believe is best for them. Our goal is to pair clients with the caregiver who can provide the very best home care services while addressing all of their unique needs. Reach out to us today to get started!